Super Hero Boy: Just NINE hours left! Not much to say at this point. The new baby will be born a little after 6:30 am tomorrow. For family and friends looking to visit or send vodka (kidding.. seriously kidding) we will be at Baptist East at least for the next few days. Best case senerio we will be back home Saturday night.. worst case I'll be there four days. I was up and pretty active with Connor shortly after surgery but I'm having a spinal this time over an epidural so who knows. 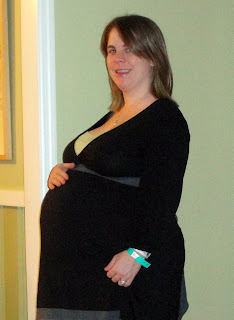 This pregnancy was so different from Connor's I'd be hard pressed to say I wouldn't be surprised if the recovery is totally different as well. Either way I'll leave you guys with this picture. A last second picture before I scrub up with my iodine scrub and attempt to get some sleep before tommorrow. I knew I had gotten a lot bigger the last few weeks and I'm WAY bigger than I was with Connor (Though I'm very proud to say our total weight gain was 15lbs total as of today) Though I didn't loose the baby weight with Connor I'm walking into surgery weighing almost exactly what I did with Connor, actually close to 10lbs less. Seeing as Connor was born at 36 weeks and this baby is just about 40 weeks I think we did pretty good! Hopefully the next pictures you guys see are fat baby pictures and a not too terrible looking one from me. heh. Check my Facebook and Twitter feeds for more up to date info. Best of luck Ang! We will be thinking of you and the little one all day tomorrow. Can't wait to see pictures of the sweet lil guy. And to think... The pregnancy is finally OVER!!! Happy dance! CONGRATULATIONS!!! It's 8:45 a.m. on the 18th so I can only assume you and the new little one are resting. Can't wait to see pics! Congrats friend!! I can't wait to see pictures and I hope you guys are doing well and resting! Hope all goes well!! cant wait to see pictures.. hope the recovery is as smooth as can be.